I tried to play counter strike on my other computer with my main computers mouse but it just spins in circles as if i'm on a really high sensitivity or like i'm spinbotting. The keyboard works fine. Can you try pressing scroll lock while you're on the server machine first before going to the client machine? what csgo needs is for the mouse to be in the centre of the screen the whole time, and thats what synergy is preventing, regardless of if the mouse can leave the screen or not, if you get what i mean? How about pressing the screen lock while you're in the client screen but the game screen is still hidden. Can you provide more details about your machines (OS version, 32/64 bit, Synergy version installed, connected to the network via Ethernet or Wi-Fi)? Hi @Valid, sorry for the late reply. 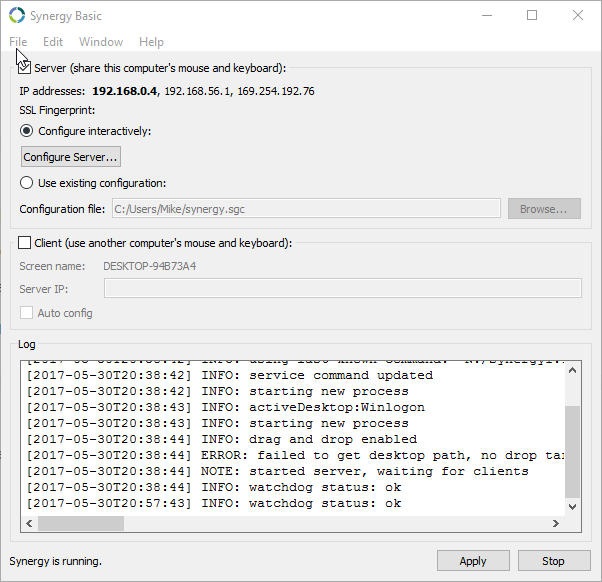 Can you try v1.9 from Download Synergy 1.9.0 to fix the wifi macOS bug forums thread? Now it says "ipc connection error: connection refused"
Please post a screenshot of both machine's Synergy interface. It looks like it is still trying to connect to synergy service. Have you made sure Synergy service is set to automatic and it is currently started? Please post a screenshot of your Synergy service properties.